The popular Holladay butcher shop, now in its fifth generation, traces its lineage back to Texas in the 1920s. Steve Griffin/The Salt Lake Tribune Will Wilson, a fifth-generation meat cutter, cuts meat at Snider's Brotherss Meats in Holladay, Utah Thursday April 12, 2012. WIlson as run the store since it opened in 1992. Steve Griffin/The Salt Lake Tribune Will Wilson, a fifth-generation meat cutter, with his wife Amy Miller in their Snider's Brothers Meats store in Holladay, Utah Thursday April 12, 2012. The WIlson's have run the store since it opened in 1992. Steve Griffin/The Salt Lake Tribune Will Wilson, a fifth-generation meat cutter, cuts meat at Snider's Brotherss Meats in Holladay, Utah Thursday April 12, 2012. WIlson as run the store since it opened in 1992. The Snider family operated butcher shops in four Western states last century, but today the number is down to a single retail meat store in Holladay. The Sniders trace their lineage to a family patriarch who got caught rustling a couple of Texas steers in the 1920s to supplement his shopkeeper income. A relative paid $200 to save his life, so the story goes, but angry ranchers said they'd string him up if they ever saw him again. That's when A.C. "Pappy" Snider fled about as far away as he could  to the Northwest, where he opened butcher shops in Washington and Oregon. During the Great Depression, the family had moved to Southern California where Charlie Snider and two of his brothers opened a string of third-generation retail meat shops called Snider Bros. Meats. The stores supported them and several other family members over the next half century. 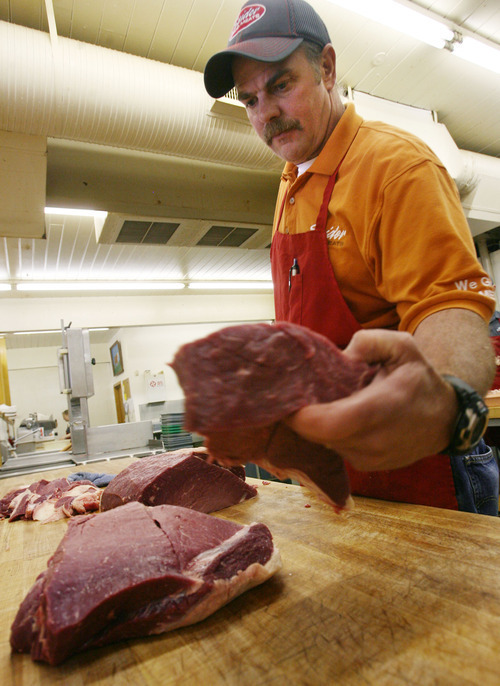 Today, the old-time name, Snider Bros. Meats, lives on in Salt Lake County, but only a single family member, Will Wilson, 50, runs the meat business, now in its fifth generation. "The name is nostalgic," said Wilson, of his maternal grandfather and uncles. By the 1970s, Grandpa Snider had retired to Ogden, where he spent his time collecting antiques and woodworking. Then one day he complained to a grocery store butcher about the difficulties of chewing cube steaks that his wife Marguerite liked to serve along with big bowls of mashed potatoes and gravy. Seems the country-fried steaks had too much gristle for folks wearing dentures. When the butcher said he was too busy to prepare special orders, Grandpa Charlie decided to start a meat shop that did cater to customers, say family members. 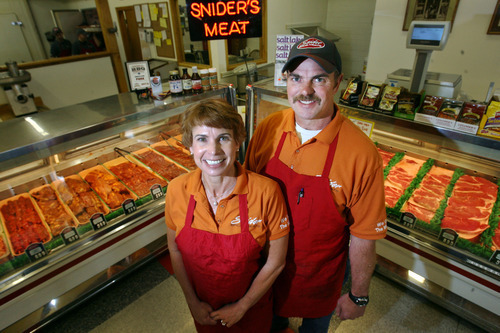 In 1983 he opened Snider's Family Meats on Harrison Boulevard, a few blocks away from the grocery store that had inspired his second meat-cutting career. Grandpa Snider had promised to take care of his grandsons Will and Kevin Wilson when their father, also a butcher, died of cancer at the age of 42. 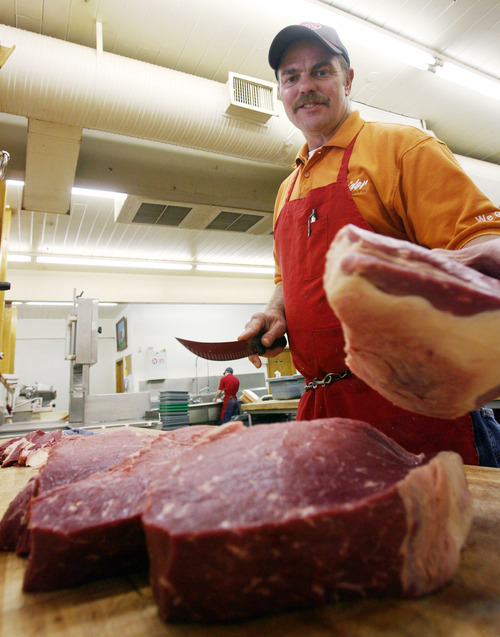 Kevin eventually ran the Ogden store, and in 1992, Will opened the Salt Lake meat shop near the corner of 6200 South and Highland Drive. Grandpa died in 2003, after teaching his children, in-laws and grandkids the meat business. Although Kevin Wilson died in 2002, his widow Sarah ran the shop until November 2010 when she closed the business. "People still come here from Ogden so we get to see customers we haven't seen in 20 years," said Wilson. "You don't build up a clientele, you build friendships through the years." Snider Bros. Meats is well known for its sandwiches, heaped with any combination of up to three meats, as many cheeses and a variety of condiments and breads for $5.98. The shop is a full-service meat market, stocking USDA Choice beef, lamb, veal, poultry, pork and gourmet foods  including a full deli. Salt Lake magazine named its offerings the "best dinner-time secret weapon" in its 2009 Best of the Beehive edition. Wilson runs the store with his wife Amy, who remembers accompanying her mother to the Ogden shop in the summer of 1983. Unbeknownst to her, Wilson noticed her and insisted that he alone fill the order whenever the Miller girl came by. Co-workers joked about the special service she received, calling her stops Amy Alerts. Still, it took months before Wilson got up the courage to ask for a date. "He's not shy but he was about that," she said. "It was pretty sweet." Wilson laughs and says the first time he saw the girl with pretty green eyes and a big smile, he did the unthinkable: He cut his finger. Same thing when she came into the store for the second time. "Grandpa told me I'd better ask her out," said Wilson, "before I lost all my fingers." They married the following year. The Wilsons had four children in quick succession, which led to hurried dinner-time meals. Amy Wilson began making pot pies and lasagna, which she froze for later use. Wilson, in turn, suggested that she offer frozen dinners in the shop. Among her specialties is an entrée made with cream cheese, Swiss cheese, special sauce and cooked apple-wood bacon, wrapped in a boneless chicken breast. Wilson credits their success to experienced, loyal employees, longtime suppliers who consistently provide quality products and his family heritage. "Grandpa said he made every mistake and faced every problem," said Wilson. "I listened, watched and learned from him so I wouldn't have to go through what he did. I learned to have a love for the business, an appreciation for people and to stock quality products at a fair price. It's a recipe that has never failed our family."